In this section we provide several Long Term Care Insurance cost saving suggestions to help you obtain affordable LTC protection. Without insurance, long term care costs would be catastrophic for most Americans and it is important to plan ahead. Premiums are based upon your age at the time you apply for coverage and you will not save on long term care insurance costs by waiting to purchase. Every year you wait to purchase means the more you will ultimately pay for your long term care protection over your lifetime. You also must health qualify for coverage. Any changes to the good health you’re enjoying today can make it impossible to qualify for coverage in the future at any price. Depending upon your age, health history and benefit selection, there can be significant premium and benefit differences between insurance companies. We shop all of the major carriers to get you the best value for your premium dollar. Your health history can be a big factor in helping you to save on long care insurance costs — 100% or more. If you’re enjoying good health today, it makes good financial sense to purchase now and take advantage of lower premiums. It’s worth repeating, those who develop medical conditions may not be able to buy LTC insurance from any of the carriers at any price. Married and spousal discounts can be as much as 40% off of your annual premium. This discount can be applied for spouses, partners, siblings and significant others. You have the flexibility to choose how much long term care risk you want to transfer to the insurance company and how much you want to retain. In other words, you can save on long term care insurance costs by partially insuring the risk. Choose a Smaller Policy: By choosing to retain a portion of the risk you can substantially reduce your premiums. For example, if you lower your daily benefit by 25% you can enjoy a 25% lower premium. Choosing a $300,000 policy rather than a $500,000 policy can save 20-30% annually. Choose a Longer Elimination Period: Think of the long term care insurance elimination period as a deductible. It is the number of days that either you, Medicare or your health insurance pays for care. If you increase your elimination period from 0 to 90 days you can save 15 to 20% off your premiums. Many people opt for this option as they are most concerned about longer term needs. Internal Revenue Service (IRS) guidelines currently list long term care premiums as a medical expense. Therefore, if your medical expenses exceed 7.5% of your adjusted gross income you can take a write off on Schedule A as an itemized deduction. Larger Tax Deductions: You may be able to deduct the entire amount of your long term care insurance premiums if you’re a sole proprietor, partner or LLC owner. This is true whether or not you itemize. 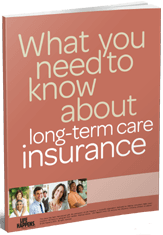 Ask your Long Term Care Specialist for a complimentary Long Term Care Insurance Tax Guide. Are you an employee of a company that offers Long Term Care insurance? If so, you may be able to get lower priced group coverage. However, many group policies have significantly reduced benefits. Therefore it’s important to obtain a side by side comparison with an individual LTC policy. If you’re a business owner or executive, you may be able to offer Long Term Care insurance to a subset of employees—often with a group as small as 3 persons. This is referred to as “executive carve-out” and policies are identical to standard individual policies but with discounted premiums. It is also common to have fewer underwriting requirements. Even the spouses of the owner or executives can qualify for coverage under an executive carve-out plan. Visit our Group Long Term Care Insurance page to learn more about the benefits of a group long term care plan. You can save up to 9% annually by paying your premium once a year. The carrier will send you a premium notice in advance of your anniversary date. You will not have to worry about when the premium is due. Our Long Term Care Specialists will help you determine which of these strategies apply to your situation. Some discounts can be combined and others cannot. Discounts may vary by state of residence.